Irregular aggregate or elongated crystals, most of them doubly terminated, with very well marked hollow terminations. 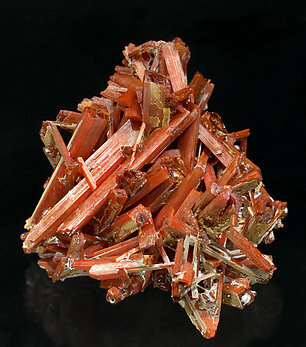 The crystals have a vivid and uniform color and, in some areas, they have unidentified coatings. Irregular aggregate of crystals with finely striated prism faces and very well marked hopper terminations. 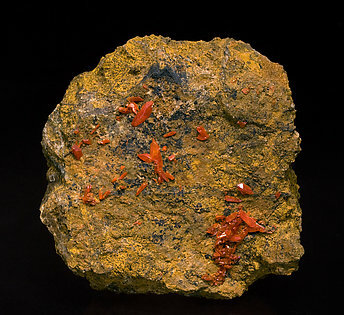 The crystals are intensely colored and they have unidentified white coatings in some areas. 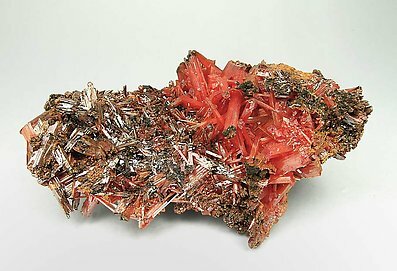 Group of thin crystals of excellent color and luster, some of them with good terminations and on Limonite matrix. 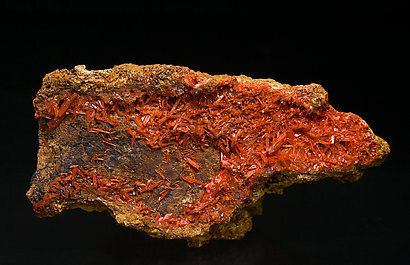 Some pictures of the sample are on different pages of the sheet 378 (March 2009) of the French magazine "Mineraux et Fossiles", in an article about Crocoite. Very well defined crystals, some of them doubly terminated, with very acute terminations and more isolated than usual. They have excellent luster and color and are on matrix. The locality, a classic for the species, has produced few samples of this quality. 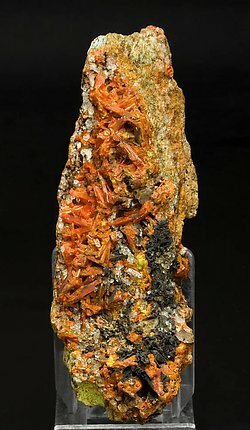 Aggregate of very well defined crystals, with very acute terminations that cover a limonite matrix. Their luster and color are excellent and the locality, a classic for the species, has produced few samples of this quality. Group of prismatic crystals, some of them with good terminations but mostly with hollow terminations. 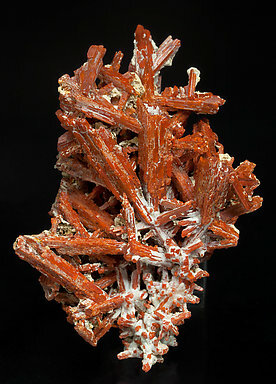 Crocoite occupies most of the specimen surface forming very plate crystals of extraordinary color and luster. 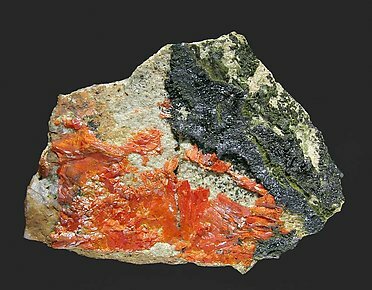 Vauquelinite is, in the picture, at the right side and forms small but very well defined crystals of dark olive green color. The specimen is from the type locality and actually it is very difficult to obtain good samples from there today. 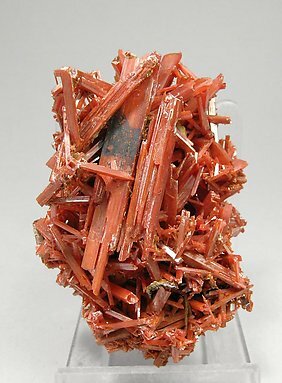 Sharp prismatic crystals of Crocoite on matrix. They are bright and with an intense color, with small Quartz crystals and growths of yellow Vauquelinite. An excellent European classic from the type locality for the species.